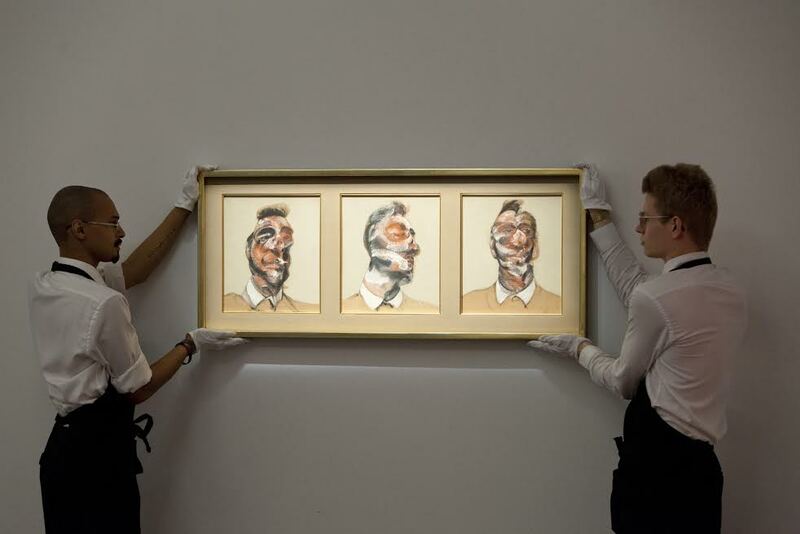 The Bacon triptych at Sotheby’s. 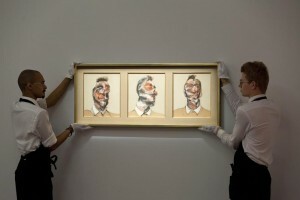 A Francis Bacon triptych of his love George Dyer sold for £26.6 million at Sotheby’s in London tonight. It attracted bids from four collectors from around the world and was knocked down to a telephone bidder. This sets a new benchmark for a small scale triptych by the Irish born artist. It eclipsed the previous record of £23 million for a work in this format. This was paid for Bacon’s Portrait of Lucian Freud (Studies) at Sotheby’s in London in 2011. Depicting the man who was the love of Bacon’s life at the moment when they were most deeply involved, Three Studies for Portrait of George Dyer (on light ground) is an exceptionally rare lifetime depiction of Dyer . It is full of the painterly exuberance that marks out Bacon as one of the greatest painters of the 20th century. An outstanding example of Bacon at the height of his powers, this museum-quality work is also of critical importance because it is, in all likelihood, the first painting for which Bacon used the legendary photographs by his friend John Deakin as source material. The painting had only rarely been seen in public, having remained in the same collection since 1970. The estimate of £15-20 million was quickly surpassed. There was global participation in the sale and strong bidding from Asia, including mainland China and Japan. There were auction records for Peter Doig whose painting Country-rock (wing mirror) sold for £8,482,500 and Frank Auerbach whose painting Primrose Hill, Summer sold for £3,322,500. (See post on antiquesandartireland.com for June 2, 2014). 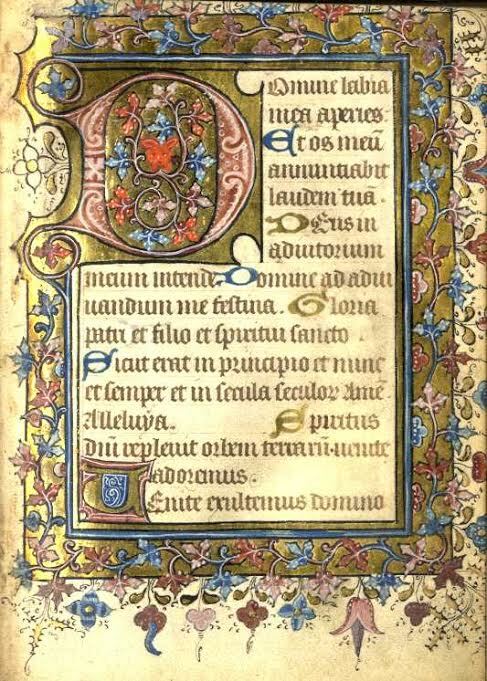 A 15th century book of hours is a highlight at the Fonsie Mealy rare book and collectors sale in Dublin on July 1. The c1440 illuminated manuscript from Flanders or the Southern Netherlands contains 153 leaves. It is estimated at 4,000-6,000. It bears the signature of one former owner, William Lattan of Wadham College, Oxford who was born c1653. There is a first edition of Dubliners by James Joyce (2,500-3,500) and a first American edition of Finnegan’s Wake (500-850). A first edition of Wilde’s The Ballad of Reading Gaol is estimated at 250-350. First editions include a signed copy of Down All the Days by Christy Brown, the first Irish language edition of Bram Stoker’s Dracula dating from 1933 and Virginia Woolf’s last book The Years published in 1937. There are works by Yeats, Lady Gregory, Seamus Heaney and even a first edition of Joseph Heller’s Catch 22. 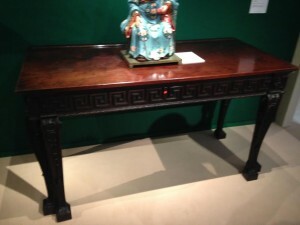 (See post on antiquesandartireland.com for June 21, 2014). 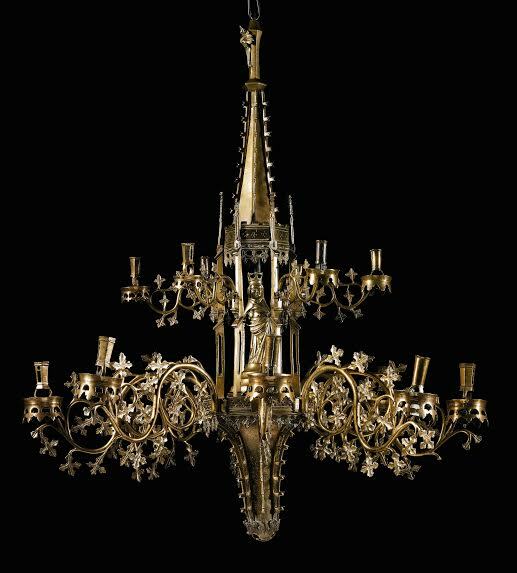 A magnificent gothic chandelier similar to the one in van Eyck’s celebrated painting The Arnolfini Portrait at the National Gallery, London leads Sotheby’s sale of Old Master Sculpture and works of art in London on July 10. It dates to the closing decades of the 15th century. 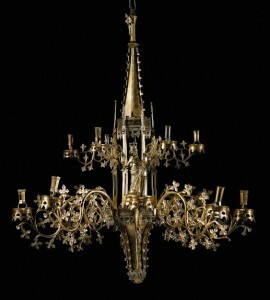 The rare chandelier is estimated at £200,000-300,000. 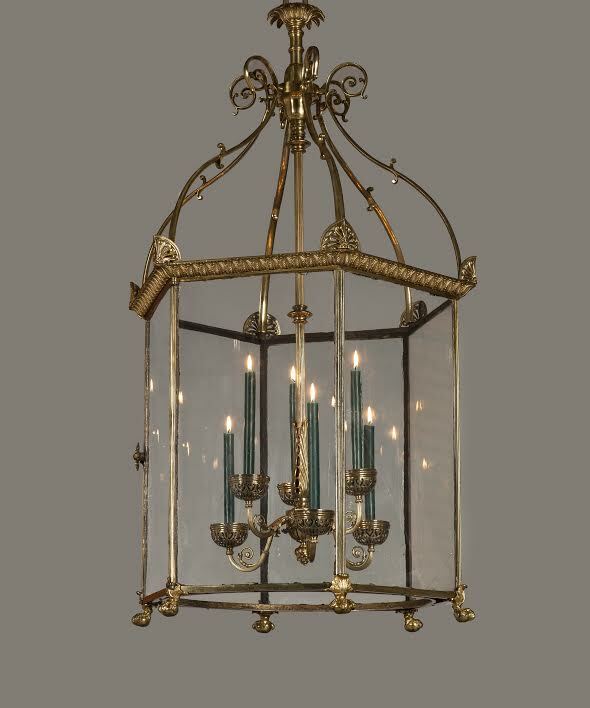 It was probably made in either Dinant, in the Southern Netherlands, or Nuremberg, in Southern Germany, two of the leading centres for metalwork production in Europe at the time. Few 15th-century examples of this scale survive. When they do they are to be found only in leading museums and private collections including the Metropolitan Museum of Art, New York and the Victoria & Albert Museum, London. THE corsage sold for more than $20 million at Masterpiece. 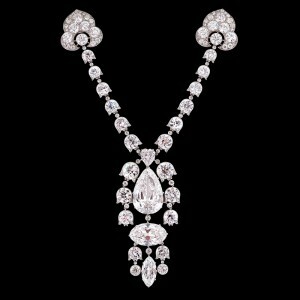 The most expensive item sold at the Masterpiece preview day yesterday was a 1912 Cartier Corsage for more than $20 million at Symbolic and Chase, who maintain a private salon at Old Bond St. in London. There were strong sales and the highest visitor numbers to date for the preview (17,000). Visitors included Charles Saatchi, Jay Jopling Wilbur Ross, Jasper Conran, Audrey Gruss, Rod Stewart, Penny Lancaster, Diana Rigg, Freddy and Muriel Salem, Tom Ford, Nasser David Khalili, Nick Foulkes, artists Howard Hodgkin and Marc Quinn, Hilary and Guy Pelley, Maria and Malek Sukkar, Fatima Maleki, Maryam Eisler, Zandra Rhodes, David Sassoon, Gabrielle and Louis Bacon, Audrey Gruss, Kim Heirston-Evans, Ellie Cullman and Scott Snyder. Museum collectors and patrons included Jeffrey Munger (The Metropolitan Museum of Art), Steven Harrison (Cleveland Museum of Art), Museum of Fine Arts San Fransico , Tim Knox (The Fitzwilliam Museum), The Victoria & Albert Museum and Abraham Thomas (Sir John Soane’s Museum). 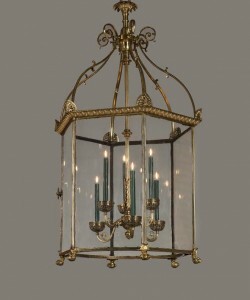 An exceptionally large and antique Irish lantern at Apter-Fredericks priced at £150,000. 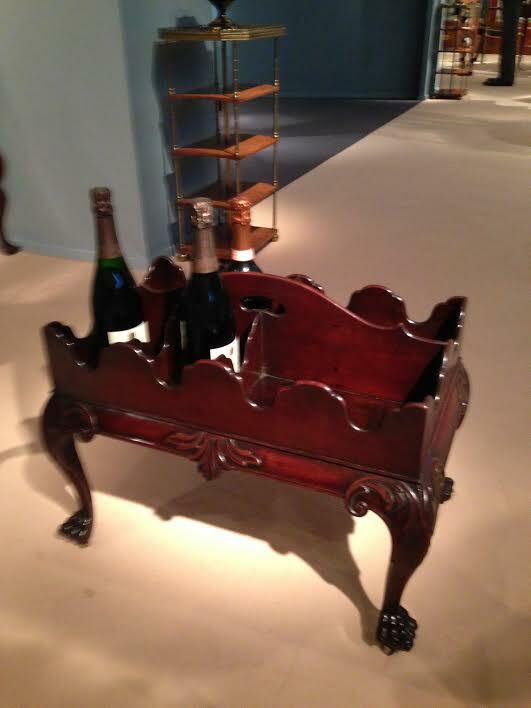 An Irish George II bottle carrier c1750 oriced £68,000 at Apter-Fredericks. 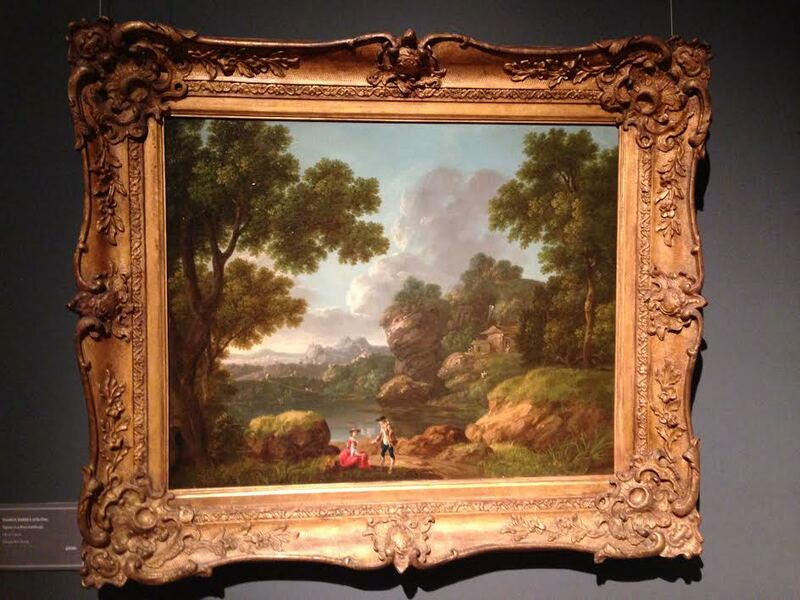 A classic landscape by the Irish artist George Barret (1728-1784) at James Harvey. It is priced at £12,000. 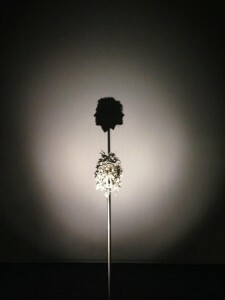 Blain Southern unveiled The Masterpiece by Tim Noble and Sue Webster. Specially created for the fair from the remains of mummified animals case in sterling silver it is a classic shadow sculpture which creates a silhouette portrait of the artists on the blank wall behind. 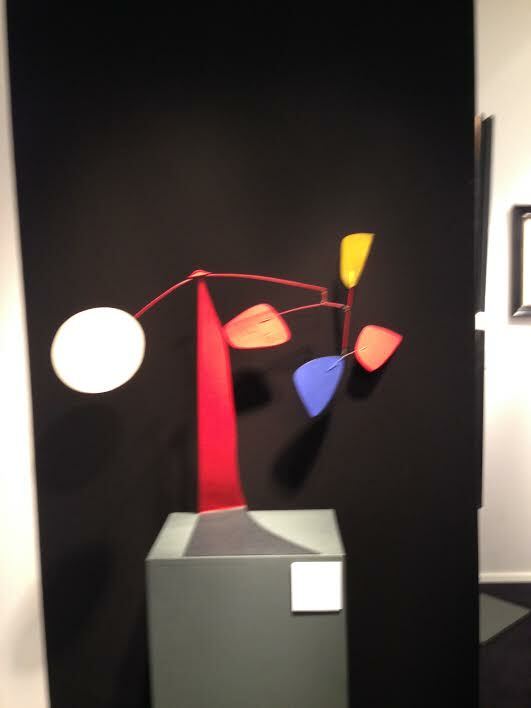 Double Dated by Alexander Calder dates from both 1974 and 1973. Its presentation against a black wall in a studio space on the stand of Barcelona Gallery Manuel Barbie is magnificent. The price is undisclosed. The Irish sculptor F.E. McWilliam was among four artists to achieve new auction records at Christie’s in London tonight. There was new records for McWilliam, Dame Barbara Hepworth, Elixabeth Frink and John Craxton. African Figure, a carved wood piece by McWilliam sold for £266,500. 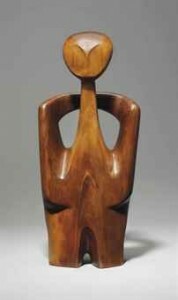 Hepworth’s Figure for Landscape sold for £4.1 million. The Modern British and Irish evening sale achieved £21.3 million. Sir John Lavery’s portrait of Anna Pavlova as The Swan sold for £158,500. Christie’s hailed these results, saying the market is buoyant. Directors André Zlattinger and Rachel Hidderley commented: “The market for British Art has never been more buoyant. The results of the ‘Modern British & Irish Art Evening Sale’ were the highest ever achieved for a various owner sale in the category and reflect the continued demand for 20th century British & Irish Art from collectors across four continents. The modern British and Irish day sale takes place on June 26. (See posts on antiquesandartireland.com for June 13 and June 12, 2014). 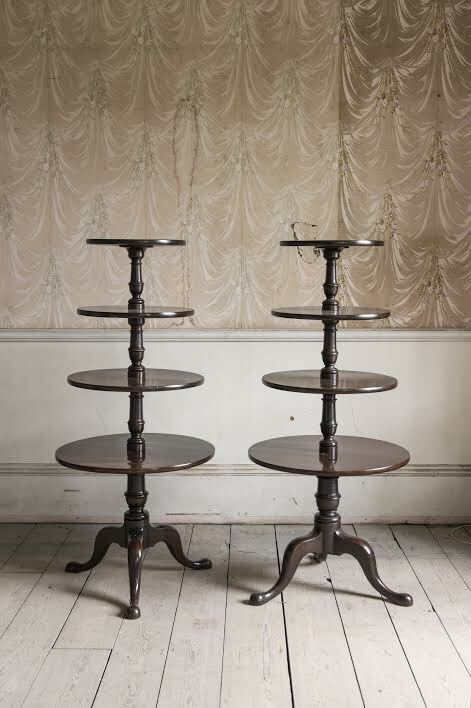 A spectacular pair of Irish George II side tables sold for a price believed to be around the high hundreds of thousands of pounds at Masterpiece today. Described as the 1st Earl of Aldeborough tables they were on the stand of Mayfair antique dealers Ronald Phillips, where they were quickly snapped up at the Masterpiece preview in London. 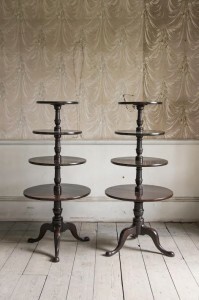 The fast sale of these spellbinding tables is a welcome shot in the arm for the Irish furniture market as it shows that top Irish pieces can hold their own with the best in the world. 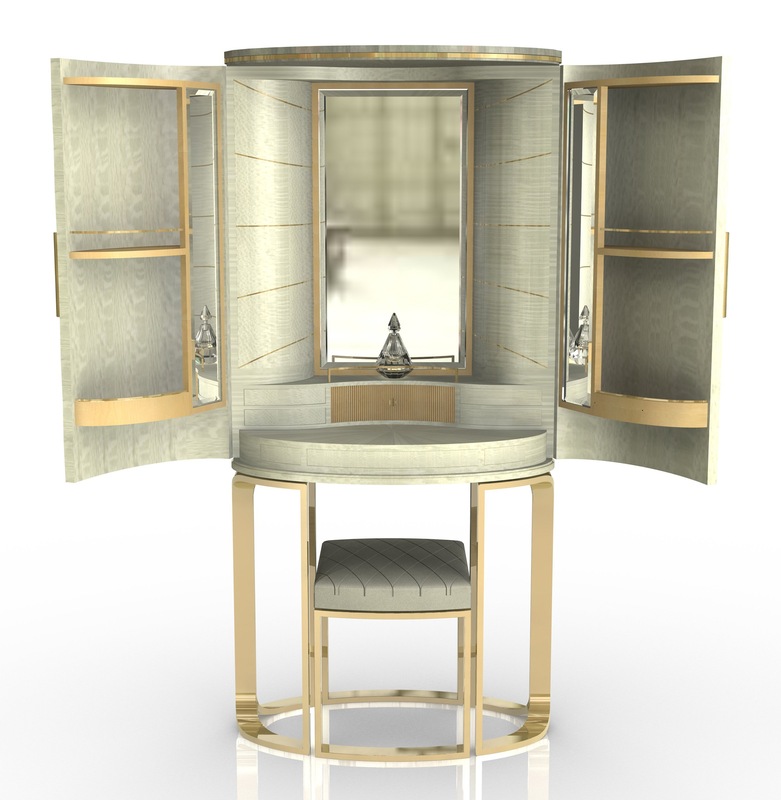 Masterpiece, though only in its fifth year in 2014, is one of the most prestigious international fairs in the world. The attendance today included celebrities, royals and the most discreetly wealthy people. Today is the Masterpiece preview. The fair proper, with 158 stands and specialists from around the world, gets underway tomorrow and continues until July 2. These tables are among the most expensive pieces of Irish furniture ever sold. The precise price is not disclosed as this is a private sale. An Irish cabinet is believed to have made in the region of £2.5 million in a private sale a few years ago. 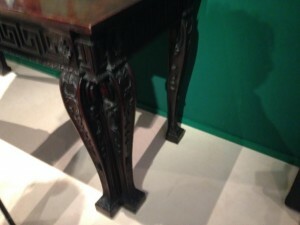 One of the Irish c1755 tables at Ronald Phillips. An image showing the leg. 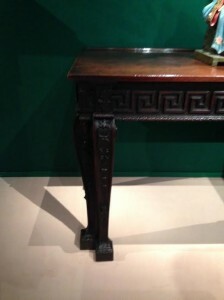 A detail of the table, made in the style of William Kent. 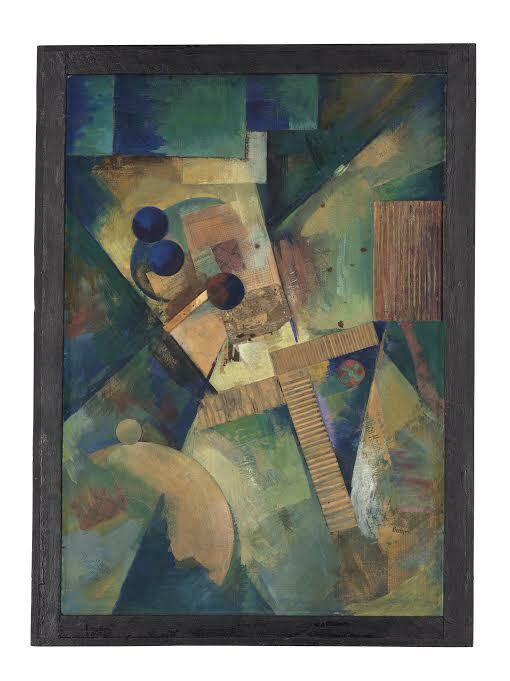 THERE was a new world record for Kurt Schwitters at Christie’s in London tonight. The top price of £13,970,500 at the evening sale of Impressionist and Modern Art was paid for Schwitters Ja-Was?-Bild (Yes-What?-Picture). It had been estimated at £4-6 million. 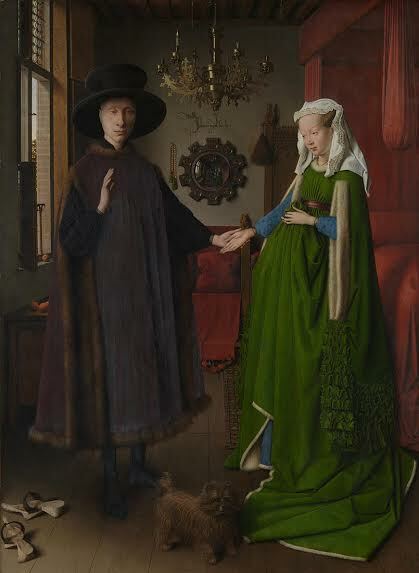 The previous record for the artist was £1.3 million. The sale realised £85,784,000. It was sold 67% by lot and 71% by value. 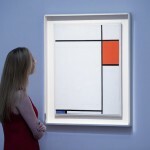 In total 22 works of art sold for over £1 million and 32 works made over $1 million. Femme de Venise by Giacometti made £9,042,500; L’artiste et le modele nu by Matisse made £6,802,500 and Kinderbild by Franz Marc sold for £6,242,500. (See post on antiquesandartireland.com for June 5, 2014). Final draft lyrics for “Like a Rolling Stone.” [June 1965]. 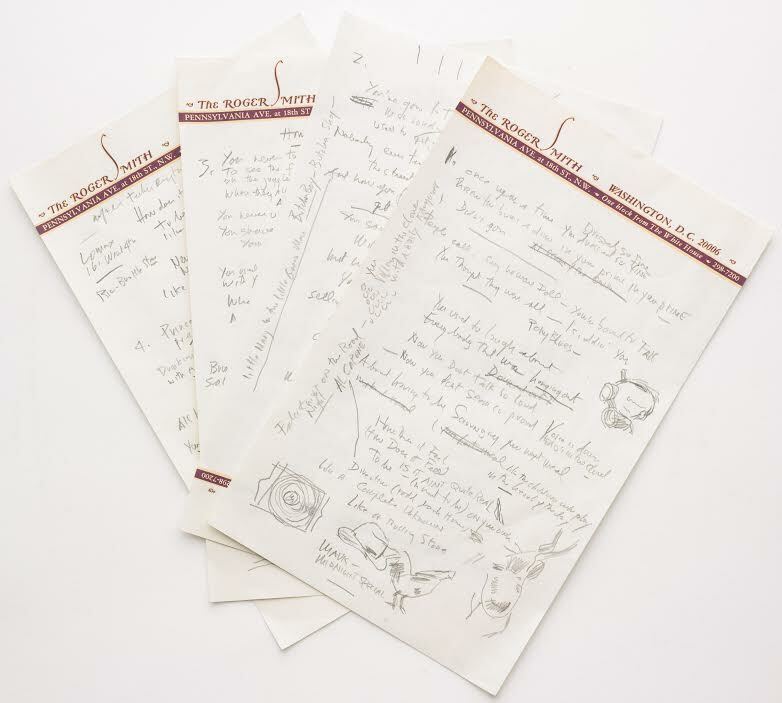 Bob Dylan made auction history at Sotheby’s in New York today when his original handwritten lyrics for Like a Rolling Stone sold for $2,045,000. The 1965 epic topped Rolling Stone Magazine’s list of 500 Greatest Songs of All Time. 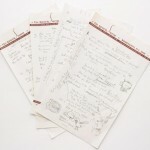 The original working autograph manuscript was the top lot at Sotheby’s inaugural rock and roll history sale in New York. It came complete with corrections, revisions and additions, written in pencil on Hotel Roger Smith stationary. There are alternate rhyme schemes for the iconic “how does it feel” chorus from the album Highway 61 revisited. Since ushering in a new musical era in the 1960’s Like a Rolling Stone has remained enduringly popular. The song transformed Dylan from a folk singer into a rock icon. The near complete four page working draft was estimated at $1-2 million. The sale totalled over $4 million. 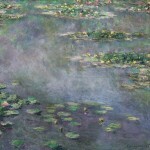 CLAUDE MONET (1840-1926) – NYMPHÉAS dated 1906. 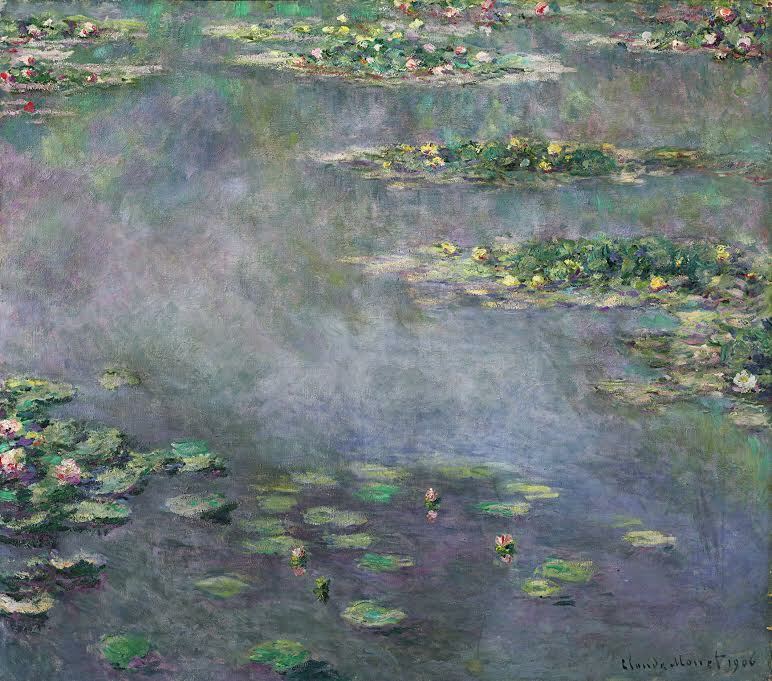 Monet’s Waterlilies sold for £31.7 million at Sotheby’s £121,957,000 sale of Impressionist and Modern art in London tonight. This was the second highest price for the artist ever achieved at auction. 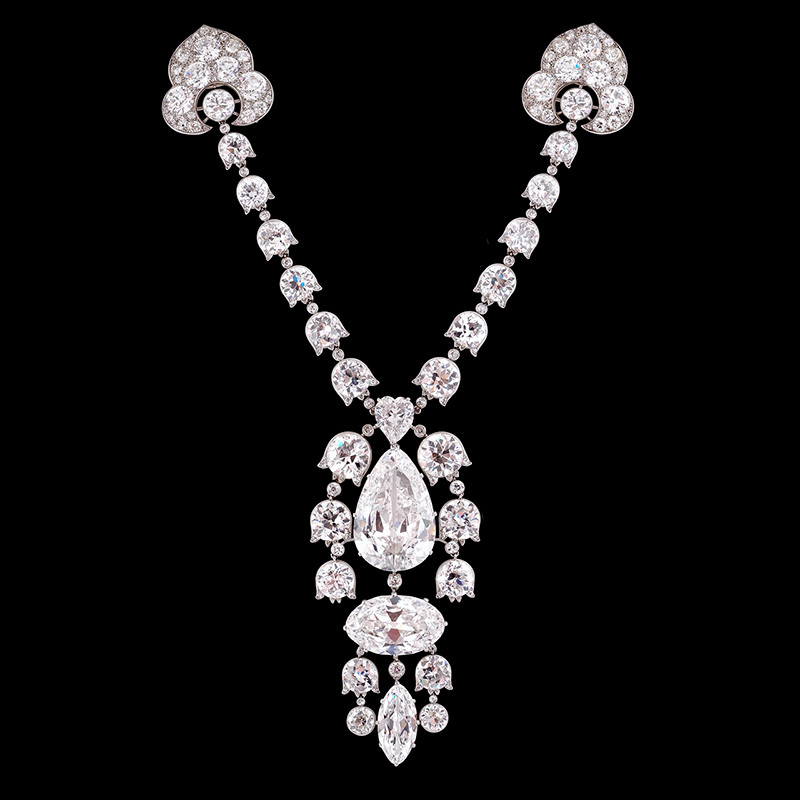 Driven by bidding from Asia and Russia the auction was 93.1 per cent sold by lot. 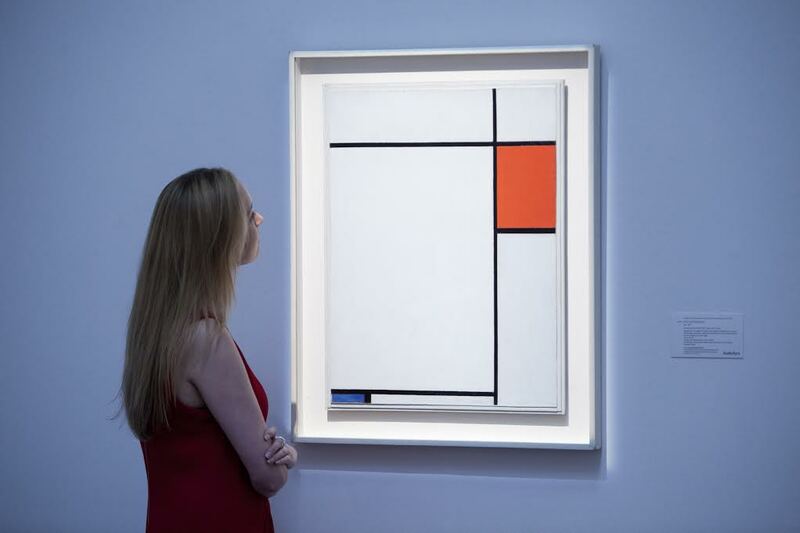 A quintessential masterpiece by Mondrian – Composition with Red, Blue and Grey – sold for £15.2 million. (See post on antiquesandartireland.com for June 11, 2014).